Heat sealer bags forms a tight, secure seal on polythene and polypropylene film with no warm-up necessary. Electricity is used only when heat sealer bags bar is down creating a 2mm seal. Size specification: The first measurement gives the width of the heat sealer bags. Buy quality food package sealer. Buy quality plastic sheets to cover furniture. 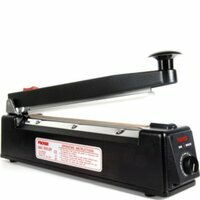 Buy quality heat sealer bags. Buy quality sofa wrapping storage.